This amigurumi gnome free crochet pattern was designed as my spring amigurumi pattern for my grandmother. I live 1500 miles away from my grandmother and every few months I like to send her a little crocheted figure to keep her company. I used to spend countless hours working with my grandmother, sewing quilts, dresses, and outfits. We made the fraternity robes for my cousin. There were a lot of good memories, but now being so far away, I need a way to show her I love her and to keep her company. So my little amigurumi critters are sent with my love to sit on her shelves, side tables and fireplace mantle. A little piece of my heart goes with each one to her. I have made so many items for her, snowmen, penguins, monkeys, and she puts them out on her shelf during the right seasons. Just a while ago she listed out everything I had made her and I found she did not have very much to put out during spring. I fell in love with the Scandinavian Santa Gnome and wanted to create a fun garden gnome version. So this is my take of the Scandinavian Amigurumi Gnome for the Spring. But I could not stop there. This little Gnome needed a loving wife that could boss him around. I am not sure why I think she looks bossy, she just does to me. For the yarn for this project I used a variety of Red Heart Super Saver Worsted weight yarn and some Big Twist Value yarn that I already had on hand. All yarn quantities are over estimations and amount for both gnomes. Final gnomes is 7.5 inches tall. Pattern will be worked in a continuous round. Pattern is in US terms. Fasten off leaving a long tail to sew the hat to the body. Attach all the other pieces first, stuff the hat and body, then sew the hat to the body. Fasten off leaving a 10 inch tail to sew the arm to the body. Lightly stuff the feet and sew them to the front of the gnome body. Fasten off leaving a 10 inch tail to sew the nose to the body. Before stuffing your gnome, sew your beard on to you gnome in a U shape. Make sure to leave room for the nose and keep the ends close to the edge of the top of the body to be able o hide them with the hat. If you choose, braid your mustache and secure with a small piece of yarn. Give your beard a little trim to shape and lightly mist it with some water, style the beard and let it dry that way to better hold that shape. R1: Work 9 Hdc into a MC, Slst to the first HDC. Fasten off leaving a long tail to sew to the hat. R1: Work 6 Sc into a MC, Slst to the first Sc. Fasten off leaving a long tail to sew to the hat. R1: Find the center 8 Ch. Slst to the Ch and Sc in the next 8 Ch. Sew the front of the apron in place before stuffing the gnome, and make a bow in the back of the gnome with the long chains. Cut 12 10 inch strands of yellow yarn for the two braids. Attach one strand of yarn to each Single Crochet like you would attach fringe to a scarf. Braid the strands together slightly pulling to one side, use a piece of yarn to secure the braid and trim the ends. Sew the braids onto the body of the gnome before stuffing the gnome. Note: Work the into row into a Magic Circle. R1: Working into a MC, *Slst, Ch1, Dc, Ch1* Repeat from *to* a total of 5 times. Slst. Fasten off, pull the MC close to create a flower. For the flower center, take a piece of yellow yarn about 6 inches long, make a knot in the center of the yarn and make 3 more knots directly over the first knot to make it larger. Weave both of the ends of the yarn through the flower so the knot will sit in the center of the flower. Secure and sew the flower to the hat. Now your little Amigurumi Gnome Couple is complete and ready to be displayed. 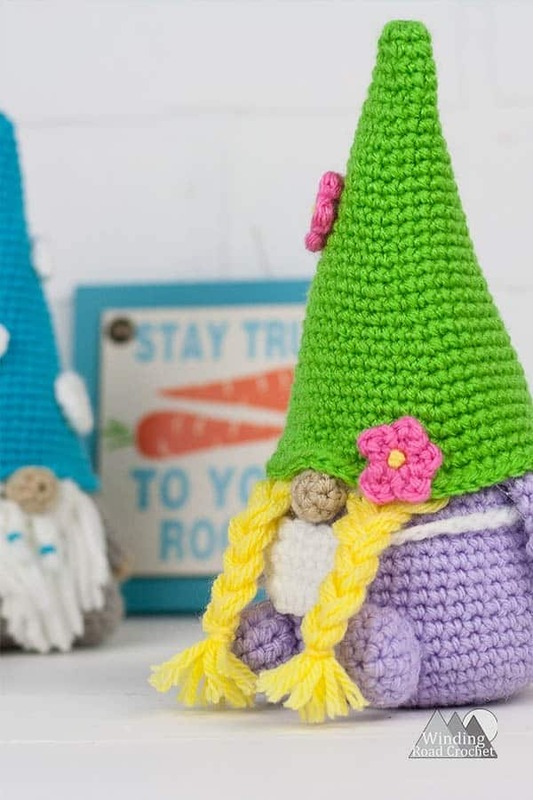 Are you going to make a Amigurumi Gnome? I would really like to see your finished piece, take a picture and share it with me on any social media! Just tag me @windingroadcrochet, #windingroadcrochet, or #ourcrochetjourney. Join my Facebook Group and share your creation with the community at Our Crochet Journey Facebook Group! Written pattern, tutorials, graphs and pdfs of the Amigurumi Gnome are copyright Windingroadcrochet.com. Please do not reprint or repost this content as your own, but please feel free to share this link with others. You can find more information on sharing my work with others in the Terms and Conditions Page. Absolutely adorable! Thank you so much for sharing these patterns! That’s so cute ! Made some for xmas but my mother will love this one for spring’s coming😊 thank you son Michel for sharing patterns . I am so glad you liked it. I love crocheting and love sharing. This couple is darling. Thank you for sharing. I can’t wait to try and make them. I love your work. Thank you so much. I love to share! Adorable and what an amazing tradition to have with your grandmother! Thanks so much for sharing. You are welcome. I love giving her something to let her know what she means to me. Very touching story about you and your grandmother. Darling gnome. Will get ad-free pattern through Ravelry. I was wondering what is the approximate height of the gnome. 7.5 inches tall. I am so happy you like it.